they won’t have to hire comic book illustrators anymore for the daily presidential security briefings. they can now print out full text version. and if letterman uses this joke, i better get mentioned, dammit. you’re right rusty, everyone has been so unfair to mr. bush. but at least we know his legacy of being the worst president of the united states remains unchallenged. 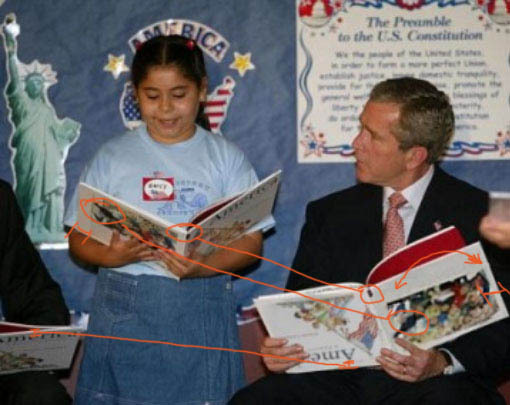 really enjoyed that the patriotic book held in bush’s hand was written by cheney’s wife. what in god’s name would the cheney’s know about patriotism? funny though. only 65 more days of these two draft dodging coward wastrels to go. thanks for stopping by.